Insulin autoimmune syndrome (IAS) involves not only fasting hypoglycemia, but also postprandial hyperglycemia. In the present study, we hypothesized that glycated albumin (GA) levels and the GA/HbA1c ratio, which reflect fluctuations in plasma glucose levels, are elevated in IAS patients. Four IAS patients were enrolled in the present study. Thirty-two non-diabetic subjects matched for gender, age, and BMI were used as the control group. 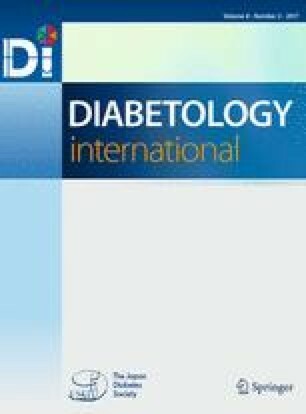 The fasting plasma glucose levels in the IAS patients were significantly lower than in the control group. However, the oral glucose tolerance test (OGTT) revealed impaired glucose tolerance or diabetes mellitus in all the IAS patients, and thus the OGTT 2-h plasma glucose levels were significantly higher than in the control group. The GA levels and the GA/HbA1c ratio in the IAS patients were significantly higher than in the control group, despite no significant difference in the HbA1c levels between the two groups. In one case in which IAS spontaneously went into remission, there was a significant correlation between anti-insulin antibodies and GA, but not HbA1c. Improvement in glucose fluctuations was observed by continuous glucose monitoring in another patient along with improvement in the clinical symptoms. Furthermore, anti-insulin antibodies, GA, and the GA/HbA1c ratio decreased, but HbA1c did not change significantly in three IAS patients along with the improvement in clinical symptoms. These results suggest that GA and the GA/HbA1c ratio are useful indicators for determining the level of disease activity in IAS patients. All procedures followed were in accordance with the ethical standards of the responsible committee on human experimentation (institutional and national) and with the Helsinki Declaration of 1964 and later versions. Informed consent or a substitute for it was obtained from all patients prior to their participation in this study.